This is one of the wedding invitations that I mocked together for my lovely bride-friend. 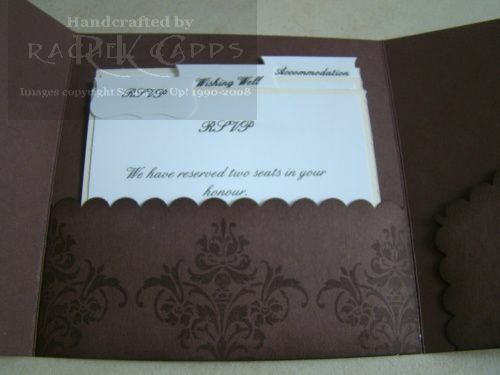 It was simple and elegant – Chocolate Chip cardstock, with a Very Vanilla textured cardstock band. 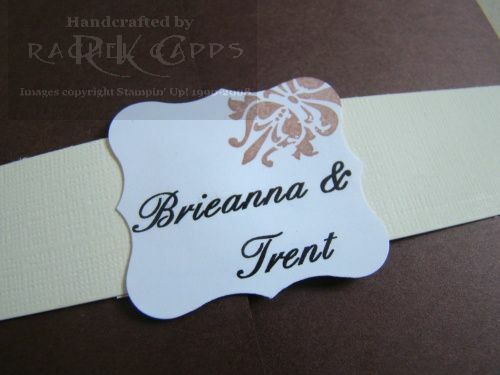 I’d printed the couple’s names through my printer and then punched them out with my Curvy Label punch. 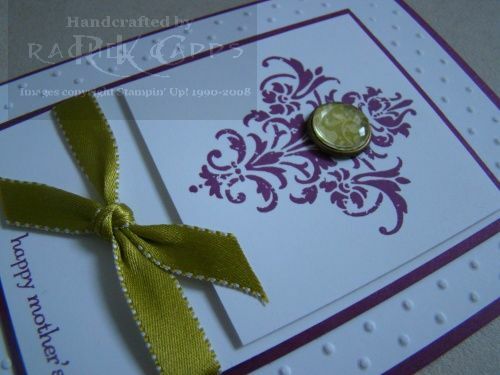 I stamped off the damask from Friends-24-7 and stamped a teeny bit of it in the corner. Then I had made little tags of information, again punching out with my Curvy Label punch using Very Vanilla textured cardstock and Whisper White. 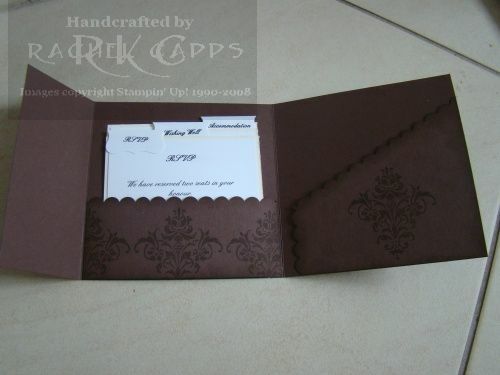 I made little pockets that the tags of information could slide into and used my Scallop Edge punch for one edge. 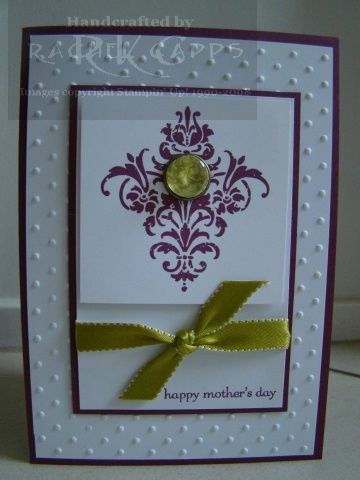 Then I sponged the edge in Chocolate Chip ink and stamped the damask from Friends 24-7. Brie wasn’t able to organise the kind of invites that she wanted in time and therefore she didn’t end up using this design, but it sure was fun making it! 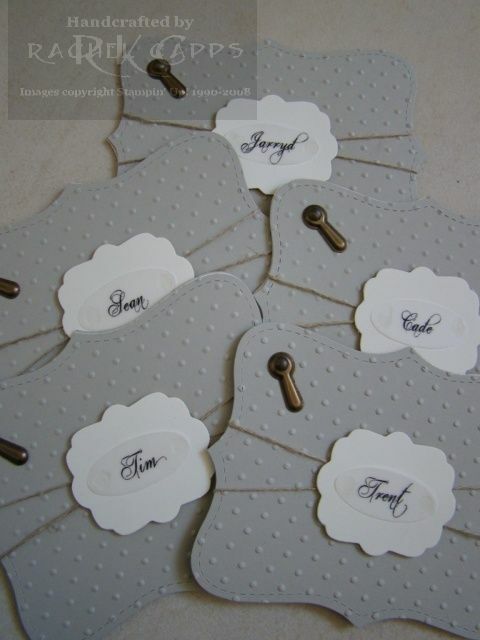 These are the boys’ gift tags that I made for my lovely bride so she can pop them on a special present she has for each of the boys in her bridal party. I tried to pick colours that coordinated with the boys’ colour, which was champagne, and so I used colours Sahara Sand and Very Vanilla. 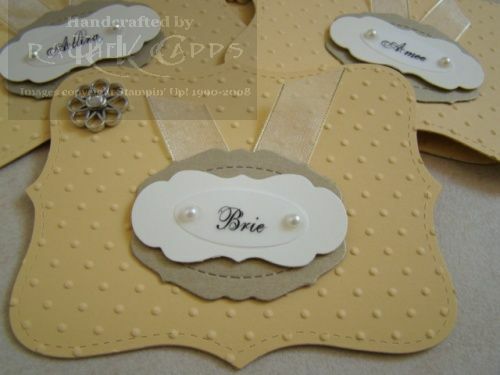 Again, to keep in theme with the gals’ tags, I used the SU Top Note Bigz Die with the Big Shot to cut out the gift tags. Then I used the Big Shot with the Perfect Polka Dots textured impression. The label was also made with the Big Shot and the Lots of Tags Sizzlet dies. I also printed the boy’s names on vellum, punched them out with the small oval punch and then used mini glue dots to adhere the vellum to the Very Vanilla cardstock. I didn’t think boys would like pretty ribbon on their gift tags, so I used linen thread for them, which I wrapped around the front card. Like the gals’ tags, the boys’ tags are also booklets. To keep in theme, in the middle top note, you can see I also stamped the damask from Friends 24-7, but this time in Sahara Sand ink. 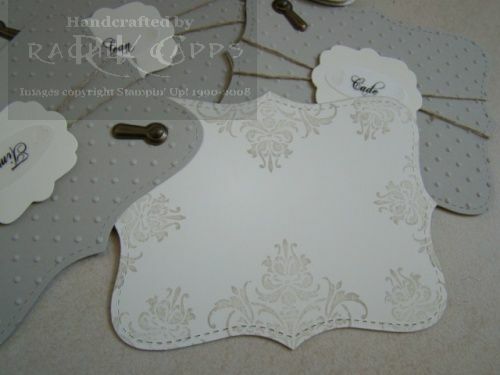 And so the gift tags could slide apart, I held them together with some SU Hodgepodge Hardware (retired). Again a bit more grunge boy-look than girlie! 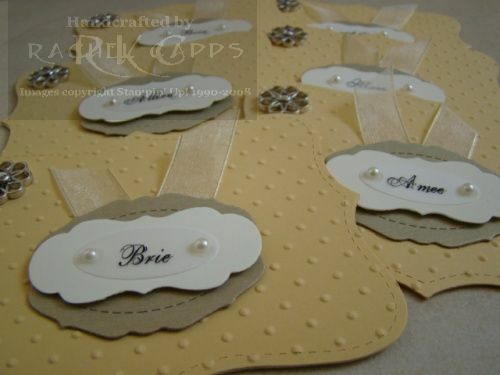 These are the wedding gift tags that I made for my lovely bride so she can pop them on a special present she has for each of the people in her bridal party, and her mum! I tried to pick colours that coordinated with the bridesmaid dresses, and so these colours were So Saffron, Brushed Gold and Very Vanilla. 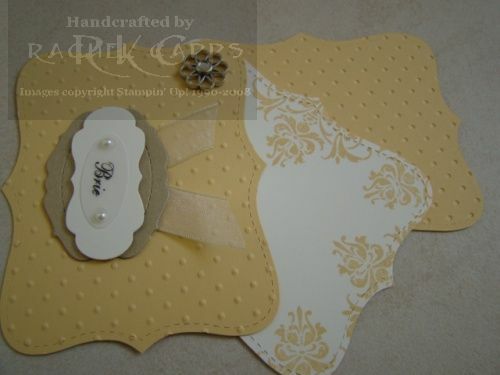 I used the SU Top Note Bigz Die with the Big Shot to cut out the gift tags. Then I used the Big Shot with the Perfect Polka Dots textured impression. 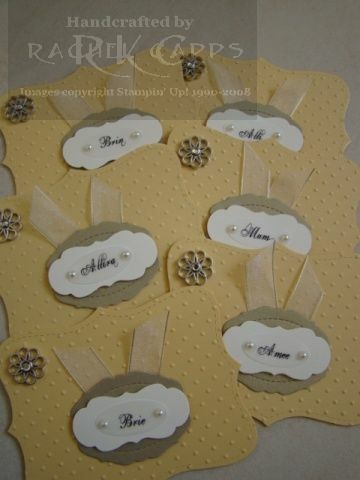 The labels were also made with the Big Shot and the Lots of Tags Sizzlet dies. 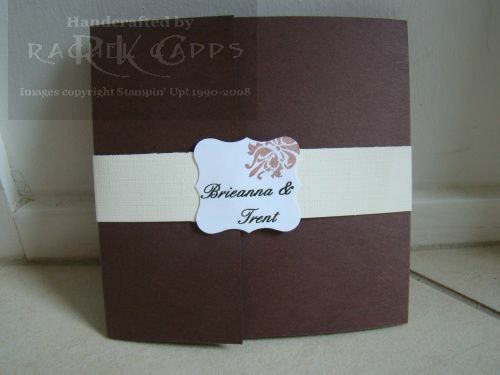 I made the gift tags like little booklets – so there is a front, middle and back. 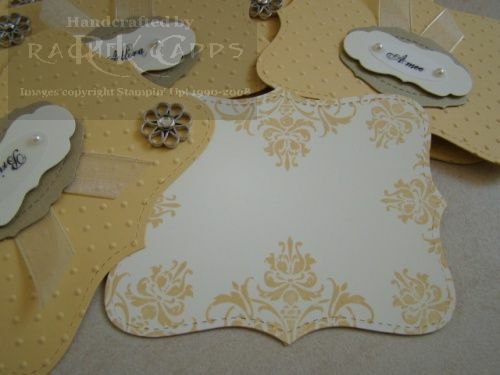 In the middle, you can see I stamped the damask from Friends 24-7 in So Saffron ink – doesn’t it look gorgeous?! I really wanted to have a middle page for the bride and groom to have a place where they might want to write a special message that might be a real keepsake for the person they were giving the gift to. And so the gift tags could slide apart, I held them together with a rhinestone brad, glammed up with a filigree designer brad. 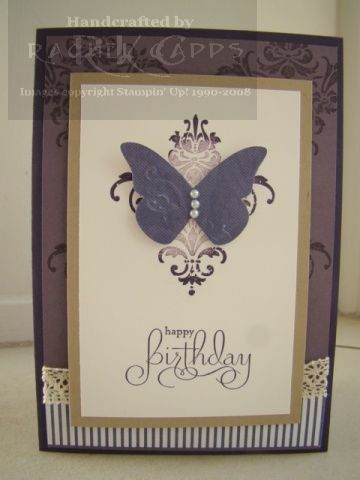 I was inspired to make this card by the talented Michelle Le-Breton. You can see Michelle’s elegant card here. 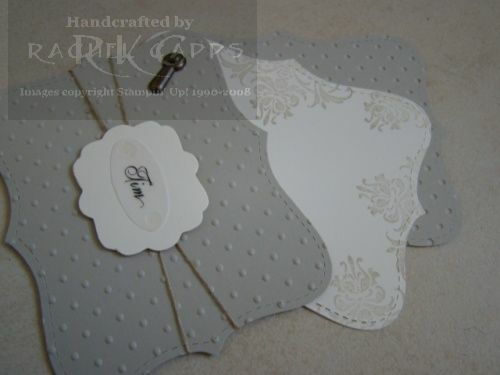 This card was also one of the make-and-takes my guests made at my Autumn/Winter Mini Catalogue launch. I had a small group of lovely ladies (much smaller than usual), so I was able to spoil my guests with some extra nice accessories. It was a fun night!